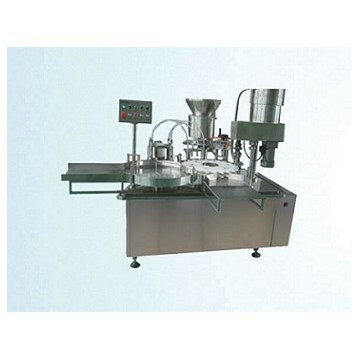 This machine can finish vials and glass infusion bottles or similar bottles filling, stoppering (butyl rubber stopper), cap-feeding and capping. It uses four heads (or six heads) filling, the measurement is done by adjusting eccentricity to ensure the accuracy. The stoppering is completed by reciprocating motion of the sector stopper , high reliability.This machine is three in one with unique design, reliable and coordinated movement, good synchronization, can be single machine, also can apply to automatic production line.